Even if you are not a fan of the Wiener Festwalzer: Andre Rieu can teach you a few tricks on making fans and followers go round-and-round in the content carousel. This summer the adored violist and his orchestra are performing 13 shows on the Maastricht Vrijthof, in the south of The Netherlands. Each show is attended by an audience of some 10,000 waltz lovers. But Rieu’s reach is extended even further via movie theatres around the globe. Smart Event Marketing at maestro’s level! 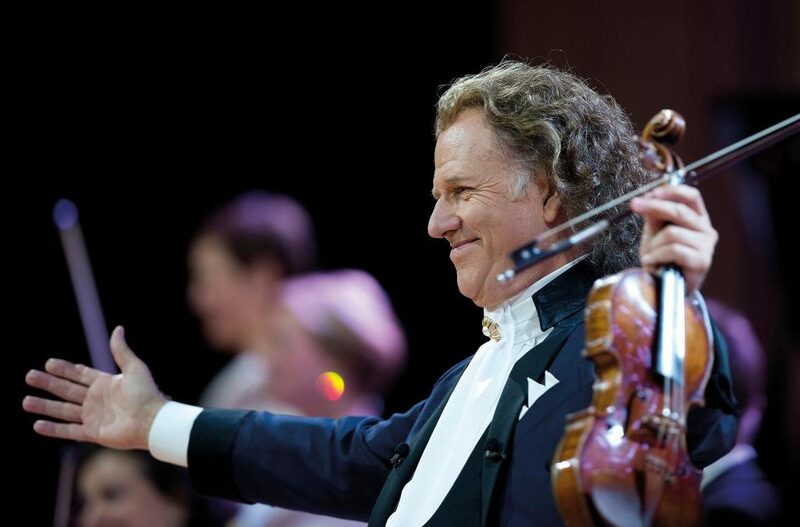 Fans from all over the world are travelling to Limburg to see Andre Rieu conduct his Johann Strauss Orchestra and witness surprise acts like David Hasselhoff parking his Pontiac on stage. A real surprise: The Hoff sings like my dad in the shower! Fans that can’t afford a trip to the Netherlands are welcome to visit a movie theatre in their home town were a live recording will be shown over the next few months. It is not the first time Rieu is starring in the cinema. At earlier Christmas shows he used satellite connections provided by the company CinemaLive to enable real-time transmission to theatres worldwide. Elton John and Bruce Springsteen worked with the same network to echo their concerts around the globe. It is superman technology! The experiments with live-streaming and cinema-viewing are examples of smart event marketing at maestro’s level. The captive audiences in those theatres support a different revenue model than broadcasting does. Andre Rieu is pulling several strings at each occasion. He is not just extending his fan-base, but also exploring new revenue streams to finance the huge investments that his shows require. Ten years ago the beloved Dutch fiddler almost went bankrupt because he just loves to have a ball. Luckily he got back up on his feet. The 2016 Christmas concerts were viewed by more than 100,000 paying visitors in cinemas worldwide. This year’s summer shows will probably break that record. Now that is multiplying by sharing! Why are Rieu’s experiments of interest to the event industry? Connecting cinemas could be an option for business events, especially when the quality of motion picture and sound adds extra dimensions to the experience. Rieu & Family (both his sons are involved too) demonstrate the power of media multipliers, a phenomenon we all know from TV. Thanks to television we can all follow our favourite sport events live. But with the arrival of the internet and social media, anybody can broadcast events to an audience of choice. Not so long ago, business news was filtered by business media. Companies would organise media events, just to court editors and reporters. Nowadays, thanks to the internet and smartphones, news is in the hands of the beholder. The balance has shifted. As a result a whole new set of dynamics is emerging between business events and media events. The empty valley between both is being transformed into a digital delta full of activity. In this terra nova we see smart event marketers join forces with public relations experts and social media wizkids. We observe how digital marketing agencies develop ideas to engage different target groups. Activate audiences. We see PR-agencies organising blogger events expecting they will create a buzz in their sphere of influence. All parties involved are exploring new tools and techniques. More events are being recorded and webcasted. Videos, reports, pictures and transcripts are made available to be echoed online. Its a content carousel. A good story is worth sharing, that is how the social media multiplier works. It enables companies to reach deeper, to engage those who didn’t attend and extend the event’s long tail online. The long tail concept is a relative new one to the event industry. This industry tends to measure the success of its meetings by the number of attendants, the quality of leads or their contribution to conversion. We are always in a hurry to score. But when social media multipliers are involved, those numbers can grow dramatically. Thats why events have great potential in content marketing. When asked by the Content Marketing Institute to rank effective marketing instruments, 69% of all professionals mentioned events. Webinars and webcasts rank second at 64%. If events can be broadcasted online, it is also possible to connect events in different locations. What used to be one huge central event could be replaced by multiple local events, connected in realtime. Another scenario is that large events are scaled down in favour of selective meet-ups that are extended online. And we haven’t even mentioned the possibilities of event-casting in companies with a flexible (multinational) workforce. His Masters Voice in a monthly webcast. We can all be a Rieu in our own companies, in our own markets! Ready for innovation. Imagine what could happen if event managers and training departments would pool their resources to develop online events, webinars and company webcasts. Cost efficiency would improve and media effectiveness could be enhanced. Now that is worth the waltz. At request of SEM & DDG, marketing futurist Antoine van der Heijden is sharing a few observations and thoughts about events as management tool. He will be exploring fresh concepts such as the content carousel and social media multipliers. The next few months we will describe more cases where content carousels and social media multipliers are used. Some of those are quite spectacular. Others just contribute to the learning curve.